Happy Kitchen Sink Stamps Monday, thanks for stopping by, I hope you all had a wonderful weekend! There some fun things going on in the Kitchen this week, Kitchen Sink Stamps will be one of the Sponsors for this week Color Throwdown, be sure to stop back on Wednesday to see the KSS card I created for this weeks challenge. I love this color combination or roses and greens. The 3 Step Hydrangea is stamped in shades of Rose on White card stock. The sentiment is from Simple sentiments, stamped in Black and Rose, then popped up on dimensionals. The background is embossed using the Texture Fades Damask Folder. I spritzed the entire card with Pearl Glimmer mist for some shimmer. What an absolutely beautiful card Lisa. I have fallen in love with the hydrangea all over again!! This rosey pink one is stunningly beautiful, Lisa! What awesome colors and layout for this gorgeous birthday creation!! Beautiful card, luv the colors! Simply beautiful! What more can I say. This is lovely! The coloring is gorgeous! I agree, those roses and greens are gorgeous together! So beautiful in these colors. I look forward to the Color Throwdown this week. Very pretty card. Love the color of your flowers. I'm sure the spritzing really makes it pop! 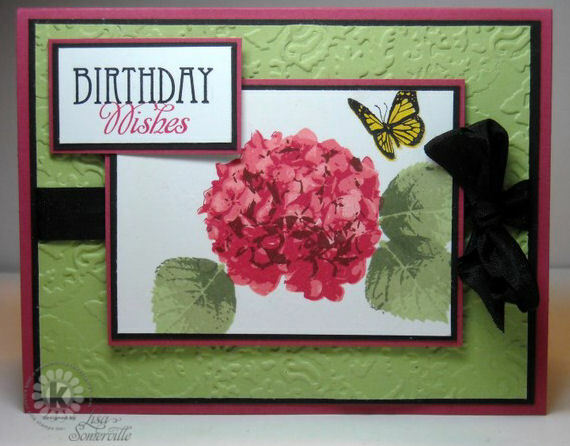 This hydrangea card is super beautiful, Lisa!! The texture on the background and colors work wonderfully with the stamped image! Fantastic work!! Love this!! So very pretty!! Beautiful card and love the design! The embossed background is a great accent to your image! So very pretty, Lisa! You have rocked the hydrangea image for sure! Such a lovely birthday creation! I'm enjoying all your butterflies too. Beautiful!